Public-private speed dating event returns for a second year, now with equity goggles. 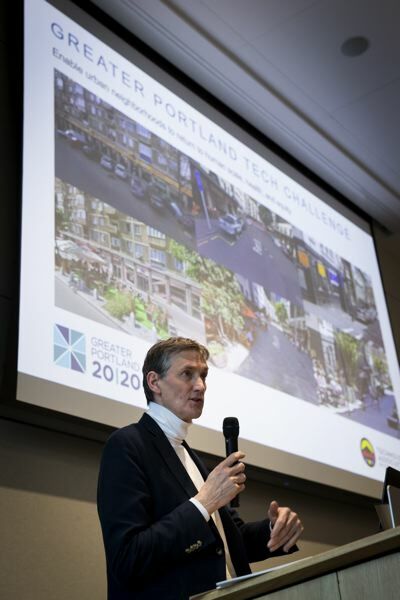 For the second year Greater Portland Inc looking for firms for its Greater Portland Tech Challenge. Partnering with the Technology Association of Oregon once again, the economic development agency is taking applications up until Feb. 15, 2019, from tech firms who think they can solve specific urban problems using what GPI's Lloyd Purdy, vice president of regional competitiveness, calls "smart-cities thinking". Tech firms will partner with public agencies to develop solutions. This year equity and inclusivity are a central theme. This means the agencies will target problems through an equity lens, such as availability of transit or ride share systems for people lacking smart phones. The event will be held Feb. 27 at Daimler Trucks North America. Holding a pitch fest in February "…allows firms to get to the meat of the challenges right away, and it enables agencies to harness our region's pool of problem-solving tech talent. This is a win-win situation built on public-private partnerships." Partners report back in the summer on their progress. The Tech Challenge's goal is to allow firms to work with the public sector in ways they otherwise wouldn't. Agencies, such as Metro or PBOT, are given three to four minutes to pitch their problem. Tech firms have three to four minutes to pitch their solution. After one on one consulting they pair off. Nine agencies and nine tech firms workshopped mobility solutions at the February 2018 event. This year, the Tech Challenge features 11 agencies pitching different challenges. Portland Bureau of Transportation: Develop an app and/or web interface to deliver digital rider passes for the region's various transportation providers in real time. Last year Mapillary, a mapping technology company, worked with the City of Hillsboro on a multi-month demonstration project. "The Tech Challenge gives firms direct, detailed insight into the issues facing local leaders," Ryan Cook, director of strategic operations at Mapillary said. "Local agencies gain a sense of the private sector's capacity to address those challenges." Skip Newberry, president and CEO of the Technology Association of Oregon, said "This is a great model for tech firms and government agencies to pilot new projects," he said. "We're already seeing others in the region use this model as a blueprint, and that's because it produces real results in a fraction of the time." The equity focus is more on the public agency end. They identify problems, the tech firms just apply to solve them. Anyone can apply. "We've seen an increase in nonprofit and public-sector participants in this year's Tech Challenge. They want to explore how technology can enable solutions to everyday challenges, and equity and inclusion are very much top of mind. Smart cities solutions should benefit everyone. Equity and inclusion are a central lens through which we look at regional competitiveness and the programs we lead. The Tech Challenge is not about doing tech for tech's sake. It provides an environment to explore solutions to challenges in our region with an intentional focus on underserved populations."